My training assignment today was “30 minutes or cross-training,” so I met my friend Lisa in Medical Lake to do the Strides for Strong Bones 3 miler with her. Well, I use the term “met” loosely because she was there prompt and early and I was praying I would make it before the start. In my typical fashion, I cruised in right as it was starting. The problem…I hadn’t even parked my car. I quickly texted Lisa to let her know that I was there so she could go ahead and start. In lightning speed, I got Fats strapped in the stroller, gear in the bottom, coffee in the cup holder, and I started running. No one was at the start line, so I prayed I was heading the right way. After I found Lisa, I had her push the stroller while I took off my sweatshirt. To my surprise and relief, she continued to push the stroller for the remainder of the race! It was a relatively small crowd, and Lisa and I cruised past quite a few people as we were busy chatting, catching up on the months since we last saw each other. Before we knew it, we were crossing the finish line and noticing that there were not very many others there before us. When the awards were announced (given 5 deep in each age group), Lisa and I both won 3rd place in our age divisions! Even with her pushing Fats in the stroller for me! She was a super trooper and I’m so proud of her. She has worked so hard to overcome a setback. 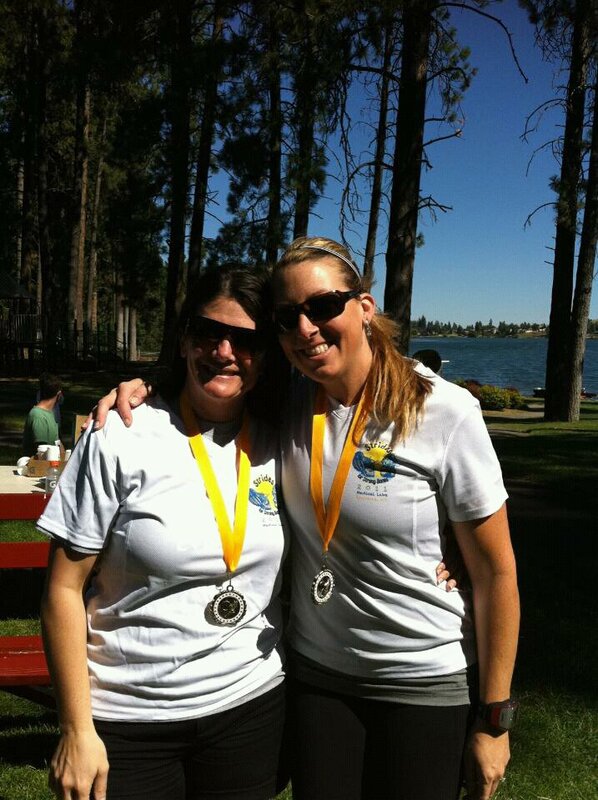 She is even considering doing her first half marathon next year…considering being the key word. We don't know our finish time because Fats was fascinated with my Garmin and apparently restarted the timer on my watch when I was holding him. He also loved the medal and did a taste test on it. It was a good day, for a great cause, and with great company.